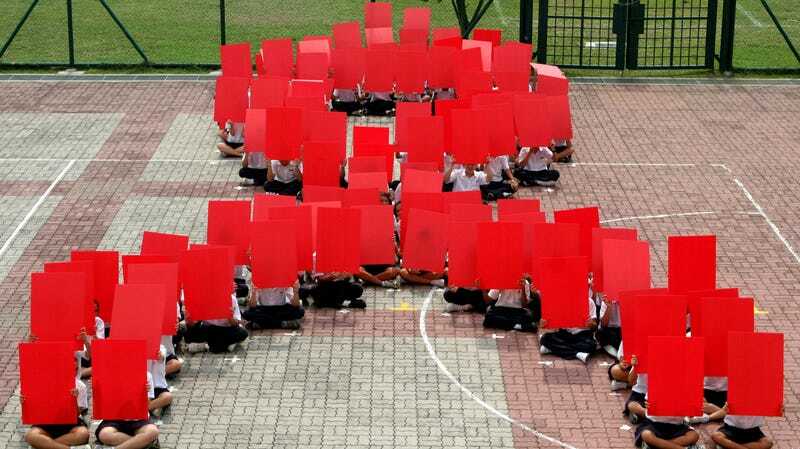 About 100 students sit in the formation of the AIDS ribbon during an AIDS awareness program held in their school, Wednesday Aug. 16, 2006 in Singapore. The MOH said the information was in the possession of a U.S. citizen named Mikhy K Farrera Brochez, who had been remanded to prison in Singapore in 2016, convicted of numerous fraud and drug-related offenses. The ministry said Brochez had lied about his HIV status in order to obtain an employment pass in the country. Brochez, who could not be reached for comment, was reportedly deported after serving a 28-month sentence. The MOH said he’d been aided in criminal activity by his partner, a Singaporean doctor who was formerly head of MOH’s National Public Health Unit. Citing a local charity, CNN reported Monday that while the law prohibiting HIV-positive tourists from entering the state had been relaxed, they are still barred from receiving employment visas or permanent resident status.